The article begins by telling how much fire the Indian “Army” fanclub of BTS possesses. Their power reached the Indian music industry when rapper Raftaar, who released a new album in August, was criticized for copying the concept of the music video of the 2015 song “Do You,” by RM, the leader of BTS. Raftaar ended up posting an official apology tweet. Due to the overwhelming song requests from the fans on social media, the Indian music channel VH1 even made a K-pop corner called “Aye.” Play time of K-pop music on India’s music streaming application Gaana is more than three times that of last year. The article referred to the data from Korean Foundation for International Cultural Exchange (KOFICE) and said the cultural exports of the Korean Wave brought in USD 8.2 billion in profit to the Korean economy, which is 6.9 percent greater than last year. Korean Wave trends around the world and Korean characters in American movies have were also mentioned. But India has just begun riding the Korean Wave. Korean food also made a contribution. According to the article, ramyeon and seaweed sheets have captured the palates of the Indian people, but it says, “Korean food is still the least known Korean culture in India.” Most of the Korean restaurants are located in cities like Chennai, Delhi, Pune, Bengaluru, and Mumbai, where Korean expatriates reside. Korean drama is introduced as the collection of all aspects of Korean culture. The protagonists of Boys over Flowers start an episode by competing for who gets to eat ramyeon. K-pop singers also naturally make appearances in dramas. But to explain the popularity of Korean dramas in India, The Economic Times mentioned cultural similarities. The cultural similarities between the two nations fascinate Saniya Thasmaishree, 16. “For instance, [Koreans] have a lot of respect for elders, like us, which is beautifully depicted in their dramas.” It doesn’t end there. Their hugs are as effusive as our “jaadu ki jhappis.” They, too, fold hands when apologizing profusely. They laugh and cry from the gut, like most of us. This section explains how Indians who keep the culture of respect in the family-oriented society and love emotional dramas are able to relate to Korean dramas. In 2017, the channel Zindagi aired Descendants of the Sun dubbed in Hindi. Also, the entertainment channel Puyhuyugam TV broadcasted at least 20 dramas dubbed in Tamil from 2014 to 2016. However, as the dramas became popular, KBS raised the importing costs, and the broadcasting of Korean dramas ended there. The article in The Economic Times is significant in that it shows a wide variety of Korean culture and shows its connectivity, but it is disappointing that it relies only on interviews rather than accurate statistical data. This may be the proof that it may be difficult to convert the Korean Wave in India to a business perspective. 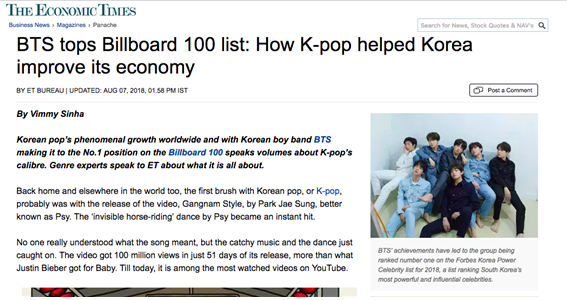 On August 7, The Economic Times analyzed in detail the effects of K-pop on the Korean economy in a feature article on K-pop. 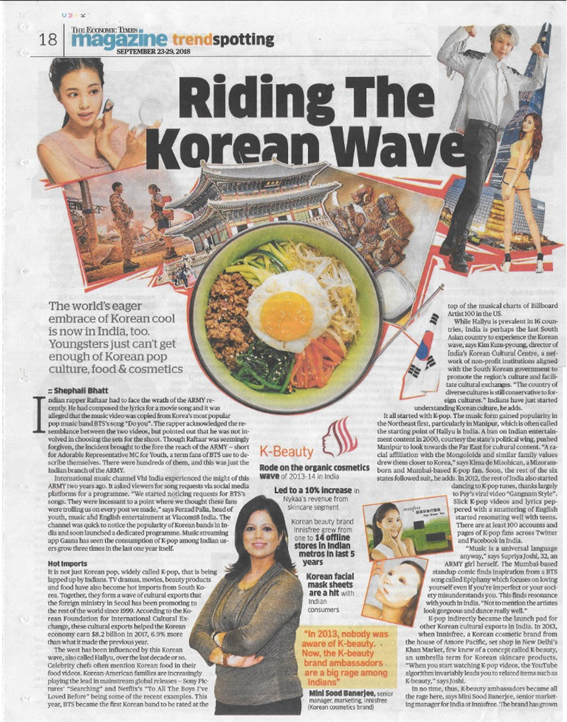 In this article, The Economic Times also introduces the Korean Wave in India from an impartial perspective. It says that the rise of K-pop in the Western world and hitting the Western music chart like Billboard Top 100 has influenced the Indian youths to like it. So far, the Korean wave in India has been perceived skeptically in both countries. Also, cultural conservatism in India, Bollywood influences, and difficulties in starting businesses have been regarded as negative signs of the Korean Wave’s influence in India. But as The Economic Times pointed out, the Korean Wave in India has just begun to reach the big cities. 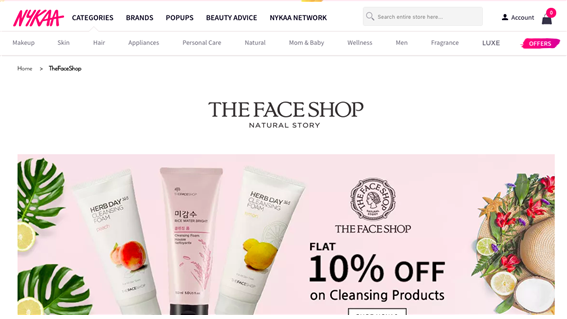 Advertisers’ interest in the K-pop program on VH1 and Amazon witnessing the orders of Korean cosmetics in small cities like Kanchipuram, Vandodara, and Bhubaneshwar are major examples. Given the cultural conservatism of India, Korea is probably the first country except for the US that had exerted such an influence on India, even if the effect has not yet been substantial. Enthusiastic Indian fans hold nothing back when it comes to opening their own K-pop festivals and entering K-pop contests with their favorite songs. Although they are living in “the boondocks” where they can’t even get a Korean music album, their love for Korea is no less than any other fan’s. They do not hesitate to criticize the act of copying the music video of their favorite singer, even if the artist is from their own country, and they incessantly nudge the broadcasting stations to play the songs of their favorite artists. This is the reason why the Korean Wave market in India, with its main base made of teen fans on the Internet, is bound to become, or, better yet, has to become bigger in the future. The Economic Times also wraps up the article with a statement that makes us think. Every fan of K-pop in India starts off with one video, either through reference or out of pure curiosity. “One month later, you know about the singer’s entire life history, their sun sign, food habits, the works,” says Joshi. This seems to apply to everything K-culture has on offer. The more you find out, the more you want to know. Even though India is culturally conservative, it will never miss out on the trends. The reason why the Indian media is covering the Korean Wave is that India is not willing to fall behind in the global trend. The more the Korean Wave rises globally, the more India will be looking into the Korean Wave domestically and will say, “The more I find out, the more I want to know.” Maybe now is the time when India had begun to ride the Korean Wave. There is a saying, “Row your boat when the tide is in.” The tide of the Korean Wave has just come to India, and I think it’s time to push the wave harder.